So! I’ve made a book of the Joyful Mysteries! And I’ve made a book of the Sorrowful Mysteries! So, it should come as no surprise that I am working on the Glorious Mysteries now… and I’m slightly excited, honestly because it’s looking lovely… even though I’m not quite ready to publish it yet. Here’s a peek of the cover! Isn’t it pretty? Coming soon! 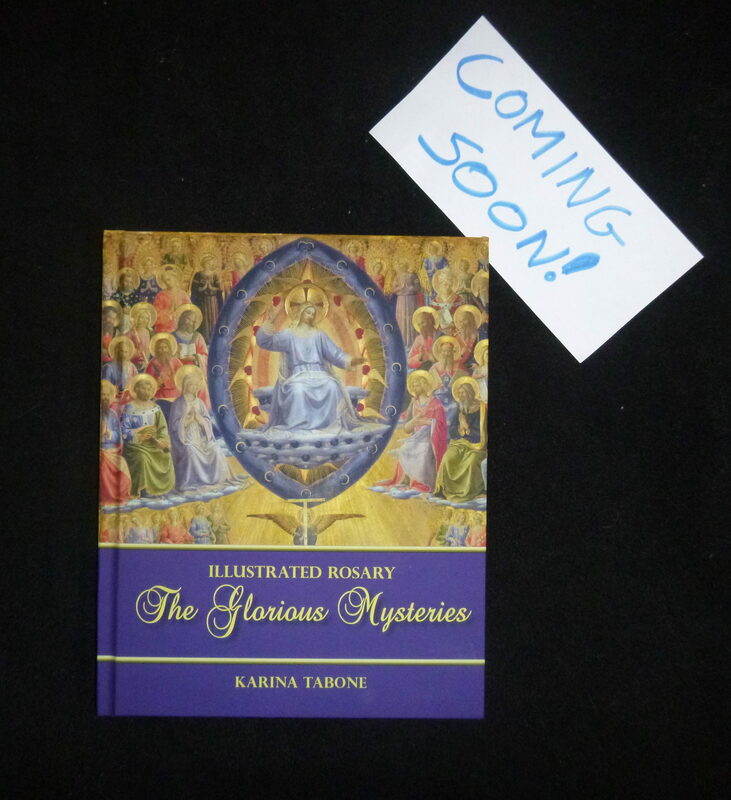 The Glorious Mysteries! As you can see, the cover looks absolutely magnificent! That Fra Angelico picture of The Last Judgment pops out and it’s just… gorgeous. I’m not sure how well you can see the cover of my proof copy, but… well… it looks purple! In fact, if you put the Joyful Mysteries book and this book together, it looks rather purple. And that’s not the way I planned it! See, the books are color-coded. 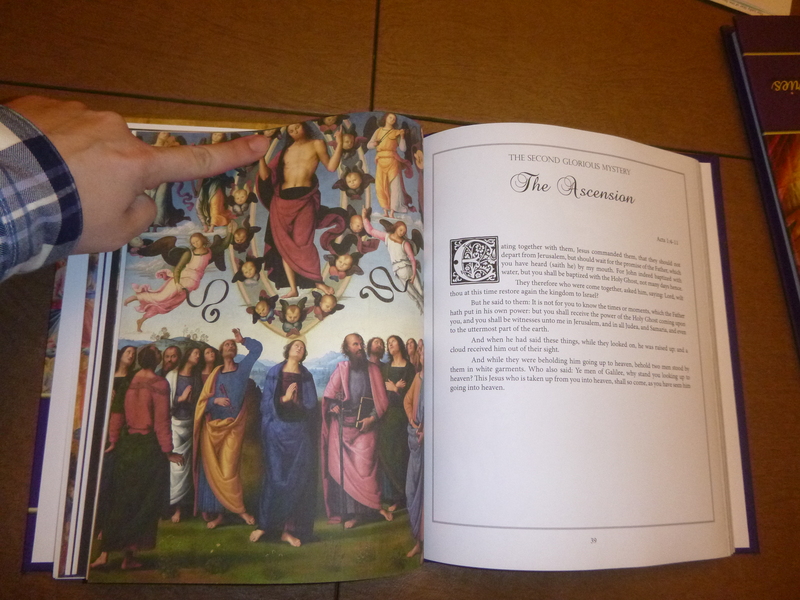 The Joyful Mysteries book is purple in honor of the Advent season, since many of the Joyful Mysteries start in Advent. (And besides, let’s face it… that artwork looks brilliant with purple.) The Sorrowful Mysteries book is red, in for the Blood of Christ. And the Glorious Mysteries are blue because of Heaven! …so that has been changed! And, let me tell you, it looks brilliant now that it’s not so purple. 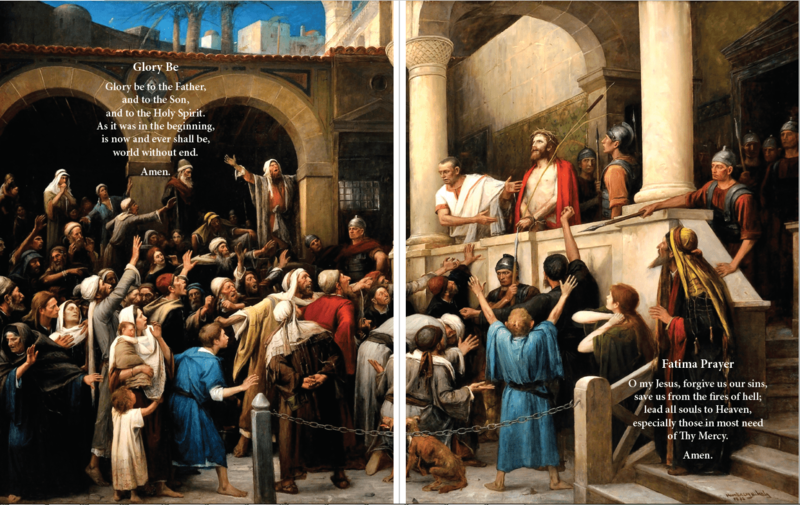 One of the more difficult parts about organizing these books is choosing the artwork that goes along with the introductory prayers, such as the Apostles Creed, which happen directly before mysteries of the Rosary. Because those prayers are absolutely essential to the Rosary, these prayers are illustrated with artwork! But, because they aren’t tied to any mystery, that gives me some liberty of picking the artwork. And that can be a tricky thing! After all, these are the artworks that help set the stage for meditation of the Rosary. With the Joyful Mysteries, the theme of these introductory prayers was clear: artwork of the Madonna and Child and the Holy Family were chosen! Then, with the Sorrowful Mysteries, I chose to start off with the Triumphant Procession Into Jerusalem, in which Jesus rides into Jerusalem on a donkey amid Hosannas and the waving of palms, so as to mimic the effect of Palm Sunday. With the Glorious Mysteries, I was a little bit more unsure of what to pick. So, after some research on the art that happens directly after the Passion and especially about Holy Saturday, I chose to focus on a couple of scenes: the Harrowing of Hell, in which Jesus descends into Hell to free the souls of the righteous, and the Triumph of Christ, in which He ascends the throne. The white lines, by the way, do not show up in the book, just in case you are worried! They are just there for formating reasons. So, what would I choose for the Introductory Prayers? At first I thought this artwork would be perfect! After all, it’s of the Harrowing of Hell, and Jesus looks pretty cool. Plus! The shape of this image lends itself to being a spread. 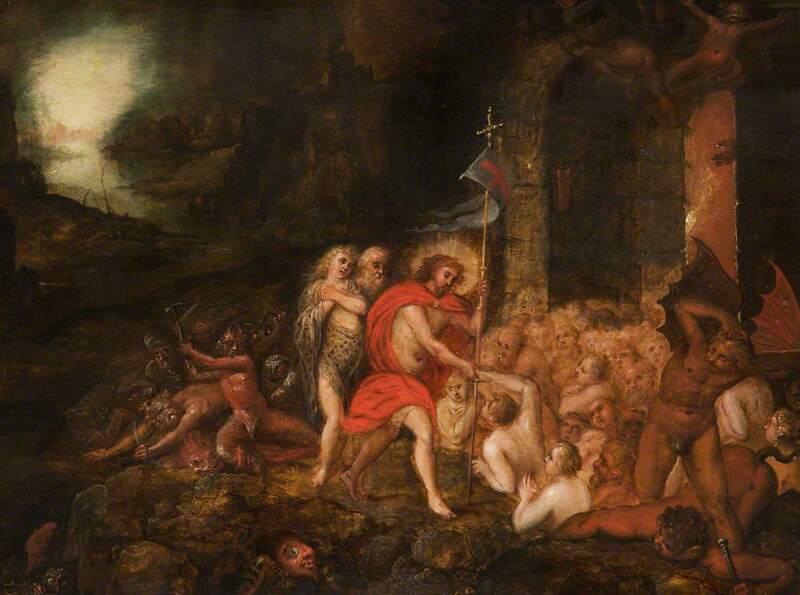 The Harrowing of Hell, by Frans Francken II, c. 17th century. Grosvenor Museum, Chester, United Kingdom. But… as much as I liked the image (look, Christ is holding His flag symbolizing His victory!) it just… didn’t work out. For multiple reasons. For one, my beta readers commented that the demon was so… detailed that it tended to distract my beta readers from contemplating Christ in His Glory. Not good for a book supposed to draw you into the Glorious Mysteries! So! After searching… and searching… and searching — did I mention the searching bit? — I finally came across this artwork! 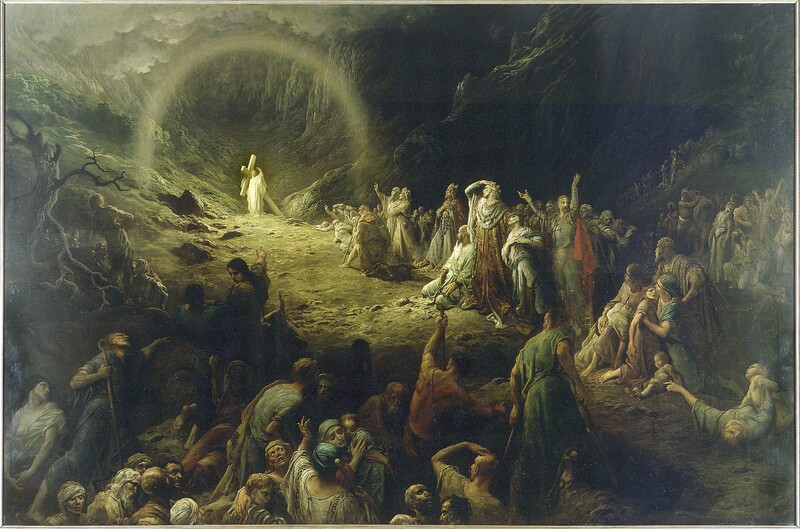 The Vale of Tears, by Gustave Doré, c. 1883. Petit Palais, Paris, France. Isn’t it beautiful?! It’s of Christ, encouraging those to follow Him along the narrow path that leads to salvation. And, even though Christ is holding a cross, He is still glorified and bathed in heavenly light! Isn’t it pretty?! It totally brings to mind the Glory of God! Of course! If you click on the artwork to look at it in its full, enlarged state, you’ll find… um… that it’s not quite to print standards. There is glare in the artwork, the photograph of this artwork contains a significant amount of noise, and it’s not as vibrant as the original painting. So! If you’ve been wondering what I’ve been doing lately when I’m juggling children and housework, I’ve been digitally restoring this image by hand. In fact! I’m nearly done! And, isn’t it a magnificent picture?! Mind you, there are a lot of magnificent artworks that depict the Ascension. A lot. So, that’s not the problem! The problem is that this is a book. See, when printing a book, the book printer prints all the pages, gathers all the pages together, binds the book, and then cuts the pages again so that, when the book is closed, the edges of the paper are smooth to touch. So, that’s why a binder full of paper is a lot rougher on the edges than a book! This, of course, means that, if you have a full page artwork that has Jesus very close to the edge of the page, it is very possible that Jesus’s head can be cropped off, even if the dimensions of the art are perfect and fit the page exactly. So! That means I need to pick a picture that is a lot more forgiving where Jesus’s head isn’t so close to the page. I would like to say here that I found much better artwork for this page and show you the new artwork that I am going to feature for this page, but alas… I am not at that point yet. I found a couple of contenders, mind you, but I have not formally chosen a picture yet! You see, one of the characteristic things about Ascension pictures is that Jesus is usually at the very tip of the artwork. After all, He’s ascending to Heaven in all His glory! And that is a brilliant thing that many artists have portrayed to an amazing effect. This works great in their art, which is a priceless, original work. But, for my book? Not so much. What can I say? These artists that lived hundreds of years ago probably never realized that we would rever their work even now… and never thought of arranging their work to be easily printed! 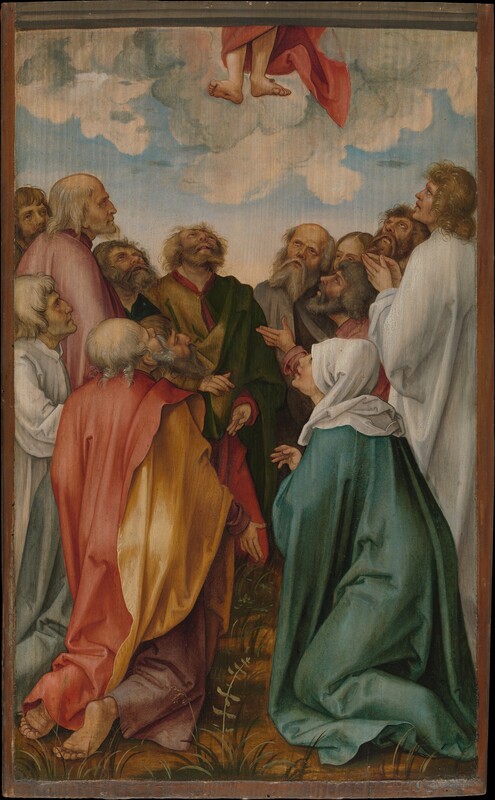 The Ascension of Christ, by Hans Süss von Kulmbach, c. 1513. Metropolitan Museum of Art, New York, New York, United States. Working on these books is so much fun, but I really do appreciate all the support and kind words that you have given me throughout this process. I said before that these books are truly a labor of love… and, really, they are. But, the fact that I can share it, not only with my children, but with all of you as well is such an extraordinary blessing. So, thank you so much and God bless! I’ll be praying for you all as we go into Holy Week!